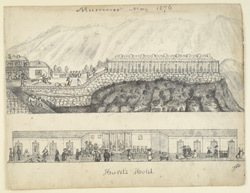 Pen-and-ink and wash drawing showing an outside and inside view of Hurst's Hotel, Mussoorie, Uttar Pradesh by James W. Browne in May 1876. Inscribed on the front in ink is: 'Mussooree. May 1876. Hurst's Hotel, J.W.B.'. Mussoorie, in the Himalayan foothills developed following the popularity of Shimla, the nearby hill station and summer capital of British India. A convalescent centre for soldiers was established at Landour nearby and the two towns soon merged. Many substantial homes appeared, precariously situated on the mountainside, some belonging to Maharajas and others belonging to more humble residents. By 1842 the town consisted of 42 houses, a hotel and five barracks. The clientele for the new resort came from far and wide and it was soon dubbed ‘Queen of the Hill Stations’ due to its spectacular and varied mountain scenery.